Q&A with David Matthews, Olympian, 05-Dec-2012, CIT — St. Finbarr's A.C.
David Matthews, two-time Olympian and Irish 800m record holder, will conduct an hour long Q&A session on athletics performance, motivation and training at the County Board meeting room at CIT on Wednesday, December 5th from 6.45pm. David Matthews is an Irish former middle-distance runner specialising in the 800m. 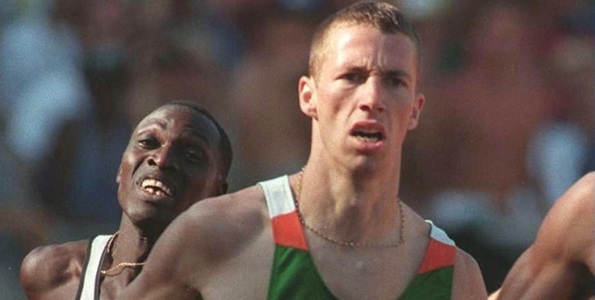 Born in 1974 in Leixlip, Co. Kildare, he attended University College, Dublin (UCD) and his career in athletics was nurtured and encouraged by the late Noel Carroll, Athletics Coach, and the late Dr Tony O’Neill, Sports Director at UCD. At his favoured distance, he won consecutive national titles outdoors in from 1994 to 1997 and indoors from 1993 to 1995. He won the bronze medal at the 1993 European Junior Championships, reached the semi-final stage at the Atlanta Olympics (1996) and the heats of the Sydney Olympics (2000). David Matthews is the current Irish record holder at 800m and 1000m outdoors. In 2011, David was appointed fitness coach of Cork GAA’s senior hurling team.